Since I last reported on my AncestryDNA match data in Updating My AncestryDNA Status and Statistics (15 September 2017), I have received a significant number of additional DNA matches. "24.7 cM in 2 segments - 3rd cousin 1x removed, common ancestors are 3rd great-grandparents John Rich and Rebecca Hill, line added to RootsMagic"
* Added to my spreadsheet for the Shared Ancestor entries including the above note information. * Clicked on the "Shared Matches" button on the Shared Matches screen to see which other testers match me,, and the person who is my Shared Match, to see if I can determine a shared ancestor. * Elizabeth King (1796-1863, my third great-grandmother) - 5 members, 3 groups, I match 3 other members. * Margaret Van Petten (1805-1873), of New York, I match 4 of 13 members in his DNA Circle. However, I do not have these persons in my pedigree chart. They may be descended from some of my known ancestors, but the connections seem to be 3 to 8 generations back from them. These New Ancestor discoveries are not useful to me at all. The great advantage that AncestryDNA has over the other autosomal DNA testing sites is that many of the testers have an Ancestry Member Tree with enough entries that a common ancestor can be found, and therefore a relationship can be determined. The major problem I have with AncestryDNA is that I cannot download the chromosome segments for the persons that I match with in the DNA Circles, the Shared Ancestors list, or the Shared Matches list. If I could do that, then I could do the chromosome painting that I'm doing with my matches on 23andMe, FamlyTreeDNA, MyHeritage and GEDMatch. 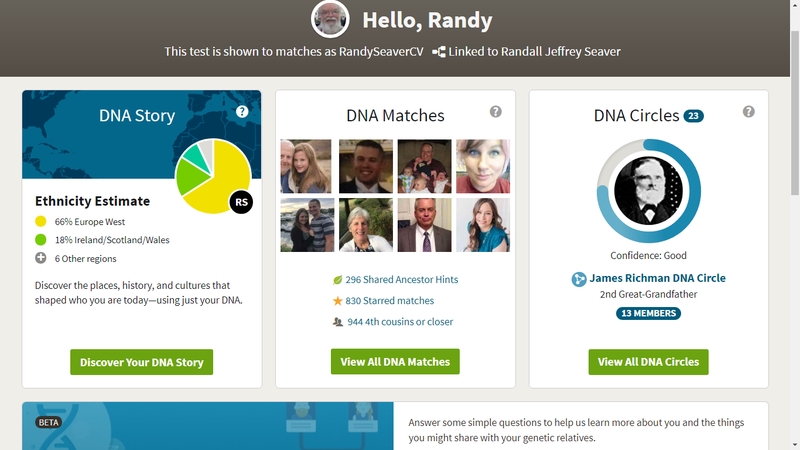 Fortunately, a few of my AncestryDNA Shared Ancestor matches have DNA test results on one of the other services. As before, he great majority of the latest new matches (perhaps 95%?) have not attached their DNA to an Ancestry Member Tree.